Almost a year after the worst natural disaster in Canada’s history, the residents of Fort McMurray, Alberta, are continuing to rebuild their lives, and come to grips with the physical, mental and environmental impacts of the wildfires and evacuation. 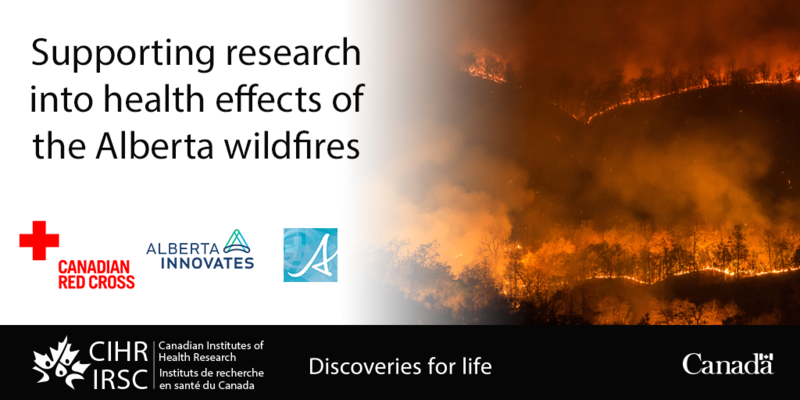 As part of its commitment to help in the long-term recovery of residents of Fort McMurray and the surrounding communities, the Government of Canada announced today the seven research projects to be funded through a $3.4M partnership between the Canadian Institutes of Health Research, the Canadian Red Cross, Alberta Innovates and other partners. Natural disaster such as wildfires can take a significant toll on people’s mental and physical health. The projects announced today will inform policy for recovering from a natural disaster by adding to what we know about cleaning up the toxic effects of wildfires and the related health impacts. They will also help expecting mothers and newborns cope with the stress of living through a natural disaster, and ensure first responders and residents of Fort McMurray and surrounding areas – including Indigenous communities – impacted by the wildfire receive the right mental health supports. The wildfires that affected Fort McMurray and other communities in northern Alberta in May 2016 forced up to 90,000 people to evacuate and destroyed more than 2,400 homes. The Regional Municipality of Wood Buffalo is home to a large population of First Nations and Métis peoples living in reserves and settlements, and in urban Fort McMurray. The building that housed the Métis Local 1935 and Athabasca Tribal Council, which provide vital services to Métis and First Nations in Wood Buffalo, were also lost. More than 25,000 people in Fort McMurray have reached out for mental health support as a result of the wildfires, according to Alberta Health Services. Natural disasters such as wildfires can have significant impacts on peoples’ health, including leading to mental health conditions like anxiety, depression and post-traumatic stress disorder, and the development or recurrence of addictions, as well as physical illness caused by poor air quality and exposure to toxic ash.